Like Paying Guest, this is one film that I absolutely love, without any of the reservations that I had for the former. First of all, Dev Anand (in his B&W avatar)! Waheeda Rehman! If that isn't enough for me to watch a film, then the fact that Vijay 'Goldie' Anand helmed the film was an added attraction. One could usually watch a Vijay Anand film without thinking too much - you knew it was going to be a reasonably decent film. So I slipped in the DVD one weekend. Raghuvir (Dev Anand) is a bus conductor who, after an altercation with a passenger is fired from his job. As he sits, still angry, but also worried, he's told Badi kadki hai; kutte ki maut maroge agar Bambai mein paisa nahin hain toh. Samjhe? Everywhere he looks, he's reminded of how important it is to have money to live. Desperate, he wanders the streets until, passing a theatre, he is accosted by a tout (Rashid Khan) selling movie tickets in black. As he watches, the price of the tickets rises as it gets closer to the time for the show. On Raghu's shoulders rests the responsibilities of his little family - an ailing mother (Leela Chitnis - was she ever any other kind of mother? ), a younger sister Sapna (Nanda) and a younger brother (Sushil Kumar). Returning home only reminds him of his unemployment. As he faces the reality of hunger and destitution that lie ahead of them, an idea strikes him - what if he buys movie tickets in bulk from the theatre and sells them for a profit just before the show begins? Desperation leads him to rob a stranger, a lawyer (Chetan Anand) of Rs5000. With that money, he first recruits the tout he had run into earlier. His name is Kalu, and with his help, Raghu quickly buys enough tickets for the premiere show of Mother India. Kalu, who is the more experienced person at this job, informs Raghu that they will need at least another two people to sell these tickets in time to make a profit. They quickly recruit others like them - unemployed, hungry, needy people, including a pickpocket who steals a man's wallet and uses that money to buy a ticket in black from Raghu. Raghu definitely has mad entrepreneurial skills; when he's down to his last five tickets, he decides to auction the tickets off to the highest bidder. There's no looking back as he exults in the money he's made in just one night - four times his initial investment. Raghu has big dreams. If they can earn 20,000 in one day from one theatre, how much can they earn from a 100 theatres? Kalu is awed by such vision, but Jaggu (Jagdish Raj) comes in with a voice of caution; Ganesh (Madan Puri), who is their only serious competitor has not only refused to join them, but has sent word that they should not try to muscle in on his territory. Kalu warns Raghu that Ganesh is a gunda; it is not good to be on inimical terms with him. Raghu is very clear - it's a fight to see who will control the black market on cinema tickets in Bombay. While Ganesh is prepared for Raghu to come stake out his territory, he underestimates his man; Raghu cleverly undercuts Ganesh and buys all his tickets, only to sell them at exorbitant rates not soon after. Ganesh is naturally livid, and takes his ire out on Kalu. It is time that Raghu settles the matter once and for all. Ganesh agrees to work with him. Raghu is now the uncrowned king of the black market; almost overnight, the pauper has turned into a prince. He's turned it into a business and it might have gone on, with Raghu becoming richer and richer, if it hadn't been for a small impediment called 'Fate'. A group of youngsters have come to watch North by North West. While waiting for one of their group to arrive, they are disappointed to find out that the show has sold out. They decide to buy the tickets in black, but one of them makes the others promise that they will not let 'Alka' know. As Raghu stands propping up a wall, Alka (Waheeda Rehman) makes a hurried appearance. He watches, dazzled by her beauty, as one of the group informs Alka that Nand (Vijay Anand) has gone to buy the tickets in black. Alka is furious. She tears up the tickets. Nand remonstrates with her - she had no right to tear up the others' tickets. (Yes, that was my first thought!) She is totally unrepentant. Even if it was a bunch of thousand-rupee notes, she would still have done the same things. Besides, if educated people like him did such things, what hopes can one have for the uneducated masses? Her words make an impact on Raghu, who has followed them. Already attracted to this beautiful girl whom the Fates have deemed fit to throw in his way, Raghu is also intrigued by her integrity. So much so, he follows her home (while Nand is left to beat his head with his books). Soon, a thoroughly besotted Raghu shifts into a flat near Alka's house. His brother and sister are young and easily made happy, but his mother is disturbed. So much wealth, so soon? she queries, but Raghu manages to calm her doubts. From then on, Raghu's only job is to follow Alka around wherever she goes, and to eavesdrop whenever possible on her conversations with Nand. He realises that Nand and Alka are college mates, and love each other in a very friendly way. Theirs is a very easy relationship, and they bicker and squabble together like little puppies. Their conversation (and being hit on his head with a book - literally!) inspires Raghu to educate himself. Much to his mother's (pleased) surprise, he also exhorts his little brother to study well because without an education, no man can make anything of himself. A fortuitous meeting with an educated but penurious man (Krishan Dhawan) helps Raghu further his self-imposed task of educating himself. In return for teaching him, he offers - respectfully - to take care of the other man's needs. Raghu proves to be a diligent student, eager and willing to learn as much as he can. Yet, his mother's initial reaction to his new-found wealth, Alka's response to black-marketing, all these continue to haunt Raghu. He brushes off those inconvenient memories and continues to follow (stalk?) Alka and Nand around. Finally, all his following/eavesdropping pays off! Raghu is thrilled. If Nand goes abroad, will he return? Of course not! That leaves the way clear for him. As hoped for (by both Nand and Raghu), Nand comes first in the examinations and is soon flying far away from his Alka. Among the people who have come to see him off is Raghu. Eavesdropping (as has become a habit) on Alka and her parents, Raghu learns that they are planning to take her to Ooty for the holidays. Perhaps she will cheer up once she is there. Soon, they are all on their way to Ooty, Alka, her mother (Mumtaz Begum), her father (M.A. Lateef) - and Raghu, who has managed to reserve a seat in the same compartment. A quiet serenade (which leads to some questioning looks on the part of his female co-passengers) and some grabbing-at-opportunity-while-it-strikes later, Raghu is persona very much grata with Alka's parents. Soon, they are (all) in Ooty, and it seems that Alka can go nowhere without running into Raghu. She is initially exasperated by his attention, and makes it very clear (Kya doon tujhe pehle se main baithi hoon dil haar ke, ja ja ja ja jaa tu jaa...) that she is in love with someone else. But as his attentions continue, she is both amused at his persistence and flattered by its constancy. Unbeknownst to her, she is also beginning to feel attracted towards him. Yet, she is steadfast in keeping faith with Nand, and in fact, tells Raghu so. Sad, but resigned, Raghu decides to leave. He's determined to change his ways though; her love is like a beacon showing him the right path. Raghu returns home to find his sister more than half in love with his friend, and his mother's health even more precarious than before. She has a tumour in her brain, and an operation is the only solution, though there is an inherent danger in that as well. In his state of mind, he believes that she is being punished for his sins. When he meets his old associates, he discovers that they have been continuing the 'business' in his absence. He remembers his resolve to go straight, and the death of a man whose life he had once saved only strengthens that resolve. He persuades his gang to give up black marketing; he himself goes to return the original Rs5000 that he stole from the lawyer and to confess his misdeeds. One unsuccessful day of honest work for pitiful rewards is enough for most of his associates to want to go back to their more lucrative profession. By the time Raghu comes there, the gang is very close to revolt. Ganesh makes his position clear - he's leaving. Raghu tells the gang that the people who want to stay with him can meet him the next day. Quite predictably, no one comes. Raghu has to resort to some underhand measures to ensure that his men will stay on the straight and narrow. A combination of personal courage and conviction, and turning the other cheek brings his men back to his side. Using their ill-gotten gains, he rents out fifty stores, setting up a Safed Bazar (White Market) where profits are reasonable and no one is cheated. Life is looking up; Raghu hasn't forgotten Alka, however, and one rainy day, he runs into her again. It is clear that she's as happy to see him as he is to meet her. As they shelter under one umbrella, they are both lost in their own memories. He takes her to meet his mother and sister ('I don't stay alone,' he tells her as she hesitates), she takes him to renew his acquaintance with her parents ('I don't stay alone either,' she jokes), and it is clear that she really likes his company. It also helps that she is quite annoyed with Nand at the moment. Slowly, she comes to a decision that will have far-reaching consequences for Raghu as well. Before that comes to fruition however, someone arrives to upset all her carefully laid plans. Besides, Raghu is yet to learn that old sins have long shadows. Vijay Anand proves his directorial capabilities once again after Nau Do Gyarah. Apart from the way he frames his shots, or shoots his song sequences, what I like most about him is the way he juxtaposes his shots - they say so much without saying anything at all. For instance, here, there is a scene where Raghu comes hurrying back to his house, rich enough to buy his mother silks and his sister jewellery. As he hastens up the stairs to his humble home, he trips and drops the packages, the contents spilling out. He is picking them up when he hears his mother sing Na main dhan chahoon, na main ratn chahoon. The stumble, the expression on his face, the contrast in the richness of his gifts and the poverty inside the home, they all make a powerful statement without much exposition. The story is refreshingly different as well. When Alka and Nand talk about parting for two years; there's hardly any melodrama, not even a few tears, though Alka is sad at the thought of the coming separation. There's only a sensible conversation on what that distance will mean to both of them, and an understanding that it makes sense to find out whether their love can stand the challenges that Life will throw at them - before marriage. Similarly, when is the last time you remember seeing a heroine who is in love with a man (not of her parents' choosing) whose parents know of her relationship? Besides, in all the stalking-turning-into-love movies that have gone before, and come since, where does the heroine get to have any agency of her own? Here, Raghu can stalk all he likes; it is not his persistence that changes Alka's heart; it is her knowledge of him. Finally, she is the one who gets to decide. I like that she is not miss-ish about her changed affections towards Raghu. I also like that she has a personal integrity - she waits for Nand to return, and she talks to him directly. I loved, loved, loved the confrontation scene between Nand and Alka.You get an idea of how these two people have grown and matured as they stayed apart, how solid their friendship really is underneath, and just how much they care for each other's happiness. 'Refreshing!' is a word I found myself using more than once as I watched this film. In fact, apart from the great plot and excellent direction, what I liked most about the film is its heroine. Nav Ketan's heroines have always been zara hatke, allowed different emotions, and not punished for being human (instead of being a 'good' woman, Hindi fillum ishtyle), but Kala Bazar's Alka is a character far, far, ahead of her times. She actually falls in love. Twice. She gets to choose between them. (And no, lightning does not strike.) She stands up for herself, and is quite okay with stating that she is no doormat who will put up with everything that is meted out to her. Main koi Sati Savitri nahin hoon jo chup chap sehti rahoon aur maaf karti rahoon, she tells Nand. She's a person one can actually root for, someone who takes an active interest in shaping her own destiny, but watching her is like watching everything in masala world suddenly turn topsy turvy. While the film would be worth it just for her alone, she is not the only character who is multi-dimensional. Used as we are to cardboard cutouts for our heroes - they are good, they are strong, they are models of integrity, they come 'first class first' - Nav Ketan heroes were usually much more than that. Here too, Dev's Raghu is a man who has plenty of grey shading his character arc. His rags-to-riches story is not due to imaandari aur lagan, but an opportunistic grabbing at a stray chance which is funded by thievery. Kala Bazar does a fabulous job of tracing Raghu's evolution from an unemployed youth to a man who becomes unbelievably wealthy selling cinema tickets in the black. Dev plays Raghu well - there is a sensitivity to the characterisation that makes you sympathise with him and his motivations for doing what he does. Dev plays it just right - lightly and with that boyish charm that so endeared him to his fans. Yet, in the initial scenes, there's a disillusionment in his eyes that cries out for someone to confide in. The script fleshes out Raghu, giving him not only intelligence and an urge to learn from his mistakes, but also compassion and empathy towards those that he loves, and those that they, in turn, care for. His path to redemption is hard; yet, it is a choice that he makes so that he can earn the respect of those who love him. The comfort level that he and Waheeda share can be seen in their interactions in this film as well. Nanda played Dev Anand's sister, and did so rather well. (In my opinion, Nanda always did look like someone's little sister; she had that kind of sweetness to her.) In an interview, she stated that she was very upset with Dev for giving her the sister's role, but he promised her that he would cast her as his heroine one day. Two years later, he was to offer her the role of Major Verma's wife in Hum Dono. Neither of the other Anand brothers are noted for their acting, being far better directors, and it is easy to see why. Chetan Anand in particular, looked like he had lost his spine - he didn't seem to be able to stand straight in the courtroom scenes. Vijay Anand came off slightly better in comparison. However, Kala Bazar must hold the cache of having all three Anand brothers in the same film. 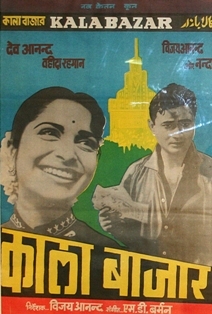 Kala Bazar is also remembered for the shots of the real-life premiere of Mother India. In an interview, Dev Anand once reminisced about how a shoe-string budget made them shoot many of the black-marketing scenes at the real-life premiere of Mother India. Therefore, you get a fantastic sequence of the who's who of the Hindi film fraternity arriving on the red carpet in all their finery - Nimmi, Nadira, Shammi, Guru Dutt and Geeta Dutt, Lata Mangeshkar, Kishore Kumar, Kumkum, Sohrab Modi, Mohammed Rafi, Mukri, Nadia, Baby Naaz, Rajendra Kumar, Dilip Kumar, and so many others. (If you look closely, you can spot Vijay Anand escorting Dilip Kumar.) What's more, this shot was not a throwaway one; it was very relevant to the plot of the film. As with Paying Guest, one cannot talk about Kala Bazar without mentioning its music. Nav Ketan regular SD Burman composed the score, and we were rewarded with a bouquet of songs that have since attained the status of classics, including Apni toh har aah ik toofan hai, Sach hue sapne tere, Khoya khoya chand, and Rimjhim ke taraane leke aayi barsaat... there is a tale about that last song; by now, Geeta Dutt had refused to playback for Waheeda Rehman, but she could not say 'no' to SD Burman. When she was called to render Rimjhim ke tarane, she apparently approached SD in distress, asking him if he didn't know why she had to refuse. SD, insistent that only Geeta could render this song for him, met with Vijay Anand, and eventually, the song was picturised in the background. This is also the reason why Asha became the 'voice' of the heroine. What could I have done without? Not much really, though the last few scenes were slightly over-the-top compared to the rest of the film. When you had a whole film with people talking and behaving sensibly, there was no need for the declamatory speeches in the courtroom. I could also have done without Raghu's speechifying. That is only a minor quibble, however, and doesn't take away at all from the overall goodness of the film, and I'm glad that I watched this film again.